Lemon Harangue Pie: Now THAT'S what I call conceal-carry! Please help yourself to some old slices of Lemon Harangue Pie while I'm on vacation. Enjoy! It's total length does not exceed 5.5 cm. It shoots 2.34 mm calibre rim fire ammunition which we have developed for it and which is the smallest rim fire ammunition in the World. 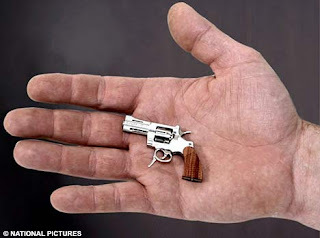 This miniature is a double action revolver and has all the same features as are found on a real size gun. The manufacture of this exceptional miniature revolver has only been possible by exploiting the incomparable expertise and latest technologies of the Swiss Watch and Jewellery Industry, upon which its worldwide reputation is built. Our revolver and its ammunition are 100% Swiss Made. SwissMiniGun is a fully authorized and licenced gunsmith company in Switzerland. Naturally, this weapon of mass destruction, with an astronomical range of nearly 370 feet, is banned from being imported into the Land of the Free. Why? Because the "barrel is less than three inches, meaning it is deemed too small to qualify for sporting purposes." I guess that makes sense. After all, when the Founding Fathers sought to keep the federal government from infringing upon the right to keep and bear arms, they were only thinking about guns used for sporting purposes.